Pregnancy is a wonderful time in a woman's life. The entire period of pregnancy is divided into 3 phases. The first 12 weeks - 1st trimester, from 13 to 28 week 2 trimester and 29 weeks before the end of pregnancy - 3rd trimester. 1 trimester - the most important and complex throughout pregnancy. It was at this time there is a formation of all systems and organs of the fetus. It is therefore essential that the woman received all the necessary vitamins and minerals. The most important in the 1st trimester are group b vitamins and folic acid. B vitamins are necessary for the proper formation and development of the nervous system of the fetus, reduce the symptoms of toxicosis and regulate metabolism in women. They can be found in meat, dairy products, bread from wheat flour, bran.Their deficiency may develop heart defects, hydrocephalus of the child, the mother has morning sickness. Folic acid is required for normal development of the spine of the fetus, its brain and spinal cord. The shortage may arise vices of their development. Vitamin a is needed for proper development of the organ of vision, urinary system. Contained in large amounts in beef liver, eggs.In the form of beta - carotene (provitamin A) in carrots, spinach, parsley, sea buckthorn. Vitamin D and calcium is needed for proper development of bones of the fetus. Calcium is found in fish, dairy products, green vegetables and fruits. Vitamin D in egg yolk, butter, cod liver, rapidly produced in the body by exposure to the sun. With its lack of a skeleton is formed incorrectly and is developing rickets. Vitamin E is many times reduces the risk of miscarriage, which rises to the end of the 1st trimester. Contains peas, wheat germ, unrefined vegetable oils. Iron is essential for preventing anemia in a pregnant woman, proper formation of blood and immune systems in the fetus. Found in liver, Turkey meat, beef, fish. Vitamin C is needed for the formation of cartilage and bone tissue, improves the immune system. Contained in greens, berries, citrus. Iodine is required for good thyroid function of the pregnant woman. Usually it is not included in the composition of vitamins, it is administered separately. But no matter how complete and balanced didn't eat a pregnant woman, in modern conditions it is impossible to get sufficient amounts of vitamins and minerals only from food. Therefore, a modern vitamin - mineral complexes, by which a woman's body will receive all the necessary components. All prenatal vitamins have practically the same composition, the only difference is the doses. Elevit pronatal contains all the necessary minerals and vitamins and a high amount of magnesium, so they are recommended when the risk of miscarriage. The alphabet: plus in the fact that the vitamins in it separated into different tablets, which makes it easy to exclude any vitamin when it is unnecessary or allergies. Vitrum prenatal: these vitamins contain increased amounts of iron, which is good for pregnant women with anemia. 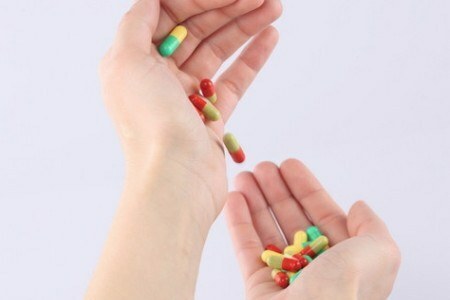 Centrum Materna: contain very large amounts of vitamin A, so it is better to take them only as directed by your doctor. Complivit Mama: the disadvantage is that vitamins A , D and groups In it below normal. Plus the fact that they approach women who believe that they get enough vitamins with food. Now available vitamins trimestrul 1, trimestrul trimestrul 2 and 3. They increased the contents of those vitamins that are needed in this pregnancy. Multitabs Prenatal: perfect for women with normal pregnancies, contains all the necessary vitamins, minerals in reasonable doses. Vitamins for pregnant women it is better to take doctor's prescription, taking into account health status and needs of the increased content of a component.